I am now writing a series of blog posts concerning the above question: Is Christ Enough? This is a really big deal for us Christians in this modern age. And it’s especially true of the so called “western world” or “first world”. That’s because we spend so much of our time and energy and attention on “making a living” and providing for our families. In impoverished countries provision is also a huge distraction because of always needing to find your next meal! So we have the opposite sides of the same coin, that of being mammon (riches or for some just daily bread). I cannot speak much into the impoverished scenario since I was born, grew up, and lived most of my life in America. However, I have seen the needy not only in this country but in several third world countries as well. But I mostly work here (in the U.S.) helping organic expressions of the Body of Christ. And yet it’s obvious that our Lord’s words in Matthew 6 apply to all people everywhere. Therefore, I believe this post will apply to everyone in the world even though I may use some examples from my own environment. It looks to me from the passage above that Jesus went out of His way to hit this nail really hard on its head! Apparently, even in those days this was a big deal. Of course, we cannot live without food and drink. Just won’t happen unless God supernaturally intervenes. So this is an important matter. I remember when I was in West Africa and my friend and I went to one of the sidewalk shops and found a statue of a man sitting almost like the “Thinker” by Rodin. Except this statue had one major difference… he had no stomach! Curious about this, I asked the store clerk what it meant. He told me that the man was trying very hard NOT to think about his stomach because he was very hungry! Wow! What an eye opener that was! So this is something that effects everyone throughout the world no matter what their situation may be. 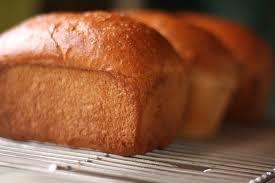 We are driven to find provision because we absolutely must eat and drink – end of story. However, that is not the main point of the words of our Lord. Wow! Is this something we all need to hear or what?!?! I would say that 90% of the believers that we work with in organic churches in the United States struggle with this issue as one of the top five struggles. There is the incredible pressure all around us to keep up with the “status quo” or “the Jones’s” and whatever that all means. Especially in large metropolitan areas there is what we used to call “the rat race” which means that we are all running around like chickens with our heads cut off trying to “make it” in the world around us. The pressure of social and financial “success” is everywhere and in everything we are taught. That’s why we are told that we need to go to college and get a degree so that we can be qualified to get a good job, and more importantly, a good career. 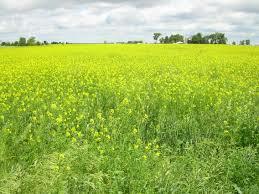 I have been sharing recently with a few churches about the Song of Solomon. It has been an incredible experience. Do you realize that “the Lilies” is one of the themes throughout the Song? The Beloved here is our Lord Jesus, the King! The Maiden (the Bride) is telling us that He pastures his flock in the garden to gather lilies. There are five other references to the lilies in the Song. Jesus is looking to gather together the lilies. The only reference in the New Testament is the one in Matthew 6 and yet it completely ties in Christ as the One (the Beloved) who is gathering lilies! However, there are things that get in the way and the world is one of them. Brothers and sisters, we are not a part of the world system! In other words; We are now completely DEAD to the world system and the world system to us! But is this how we really live? If we are really honest with ourselves isn’t it true that we get most of our cues from this world system instead of God’s kingdom? Saints, do you know who is the mastermind behind the scenes controlling the world system? But are we taking cues for our lives from this system? Are we swallowing the lies, philosophies, psychology, goals, and dreams of that system instead of the Lord Jesus Christ in His Kingdom? Is the “American Dream” our dream or is it what King Jesus wants? Seeking the kingdom means that we put all of our attention, our goals, our resources, our thoughts, our time, and our focus on the interests of God instead of Man! And guess what? The Lord Jesus (the King of the Kingdom of God) guarantees us that if we put His interests and priorities first that He will completely take care of all our physical provision! And that’s not all! He also promises us that we will live a worry-free life. Do you see that? Matt. 6:33 is a spiritual principle. But it is a conditional principle! It’s as if He is saying: “if you do this, then I will do that.” If you see first my interests, my purpose, my kingdom, then I will take care of all your physical needs. Wow! What a deal!!! Of course, what our Lord is talking about here is pure and simple faith. That is, complete trust in Him. It is by faith that we bring things that are not seen into the seen realm. It has to do with the word “substantiation”. Now faith is the substantiating of things hoped for, the conviction of things not seen. In other words; faith actually brings the invisible into the visible world! When we trust God with all of our provision He will do it! He will bring it into this physical world by our simple trust in Him. What a King we have! All My Ebooks are Half Off! Just wanted to send you all a quick notice that all of my ebooks are on sale at Smashwords this month – July 2016. You can get them for half off the normal price for this month only! These are ebooks only, not printed books. Make sure you use the discount code at checkout! Only 2 Days Left to Register! Only 2 Weeks Left to Register! A NEW DISCIPLESHIP COURSE & A FREE BOOK – LIMITED TIME OFFER! 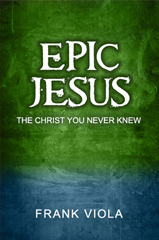 My good friend and coworker Frank Viola is giving away his ebook EPIC JESUS: THE CHRIST YOU NEVER KNEW for FREE this week on PDF. You can get also get the book on Kindle and Nook for .99 cents. Also, Frank just launched a new online discipleship course that’s discounted until October 1st. 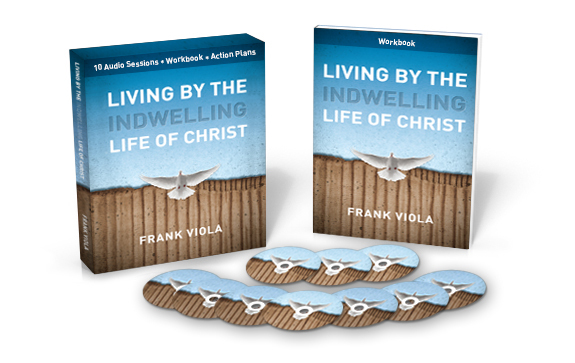 The course is called Living by the Indwelling Life of Christ. I heard all the messages for this course live and I recommend them to all organic churches and individual Christians who want to go deeper in the Lord. The course is a 10-audio program that comes with a with a practical workbook. You will want to check out the new book by my good friend and co-worker, Frank Viola. The book is available to order now but you will want to wait until May 1st, trust me! There have been many books that have strongly influenced my life and work. The books of Devern Fromke are somewhere close to the top of the list. Please check them out on this recent blog post of Frank Viola. I just wanted to write a quick note to let you know about a great new blog called: Sightings – Seeing Christ in Modern Media. It’s very unique because it’s written by a sister in the Lord by the name of Megan Proctor. And Megan reviews movies. Now, that doesn’t sound very unique at first, however, these reviews are not just about the movie itself, but how Megan sees the Lord Jesus Christ in the movies! What incredible insight and articulation the Lord has given this sister. I recently watched a movie (again) called “Remember the Titans” starring Denzel Washington, who is one of my favorite actors. The story is about a high school football team, racial integration, and the struggles between the players and the coaches who have totally different viewpoints on how the players should be trained. I definitely recommend the film. At any rate, there is a scene in the movie that brought to my memory something the Lord Jesus said once and how Christians have responded to and received that one statement. At one point in the movie Denzel (head coach) tells the team that he absolutely demands perfection. At one point, he will expect the team to be perfect. Sound familiar? This is part of the sermon on the mount and I don’t know about you but for years I had a problem with this portion of scripture. I mean, c’mon man! How could God actually demand perfection from me? I mean Jesus, in this so-called “sermon”, goes through the law and then adds to it. At one point He keeps saying that “you have heard it said” referring to Moses and the law. How could he ever expect me to live up to such a high standard? The simple answer is that He doesn’t. And the only way this is even made possible is by a two-fold “secret” that is the essence of the new covenant. It is called a mystery by Paul because it requires revelation from God to understand it. And believe it or not, that mystery is revealed in the movie Remember the Titans. It takes place during a critical part of the movie when the team is on the verge of winning or losing the championship. This whole passage is within the context of a “kingdom”. Jesus is describing to us what His kingdom, His nation, His corporate body would be like. It is a description of the Christ, the full Christ, the whole Christ; Head & Body, Vine & Branches, Bridegroom & Bride, Foundation & living stones. This is the corporate Man that God has always wanted (see Gen. 1:26-28). He (or She) will be perfect. She (or He) will do all of these things out of the nature and life within her. But how is this possible? This brings us to the second part of this mystery. “Christ in you (plural) the hope of glory.” (Col. 1:27) Because Christ now lives within us individually and corporately He can actually live His life in and through us. Now, by faith, we can live by His life and nature together to fulfill God’s dream of a creation, a corporate entity, that fully expresses the life, nature, and character of God Himself! This is the only way that this can happen. We, the Church, are perfect (mature and complete) as we live out His life within us together! See a free sample, hear the audio, and order the ebook here!